If you’re looking for a Replacement Belt for your Olympyk Chain Saw, Trust Jack’s. Jack’s is consistently rated by our customers among the top retailers on the web. 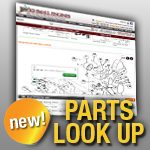 Another reason to trust Jack’s for all your outdoor power equipment replacement parts.